LOCATION This attractive property is situated within a short walk of Billingshurst’s mainline station, which provides a regular service to London Victoria as well as the south coast. Penfold Grange is renowned for its pleasing mix of house styles and elevational treatments with Turner Avenue arguably its most prestigious road. Billingshurst provides a good range of amenities including schooling for all age groups and a leisure centre with swimming pool complex. The larger market town of Horsham is approximately 7 miles distant. PROPERTY This substantial six double bedroom executive home is situated in a premier road in the sought after Penfold Grange development. Boasting impressive living accommodation over three floors this large detached house is ideal for a busy family offering ample space for all with further potential to extend to the rear or side if required. The position of the property allows for quick and convenient access to the local schools, village centre and train station and the property is offered for sale with vacant possession. The ground floor comprises a large entrance hall on entry with the main reception providing a double aspect and central fire place. There is a family room on the opposite side of the hall which offers flexibility of use but makes a great teenagers den, playroom or study. Finally, there is a large kitchen/ breakfast room and utility. The first floor provides four double bedrooms, two of which provide en-suites facilities and there is another bathroom off the landing. 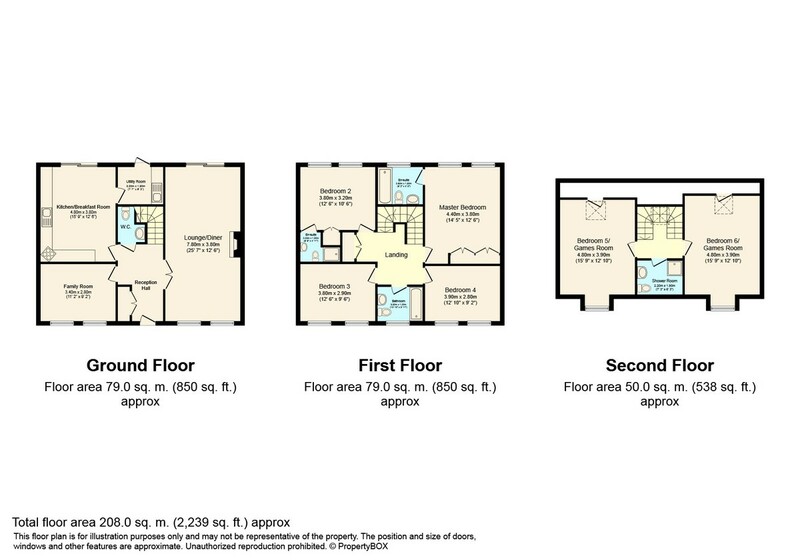 The third and final floor offers two further double bedrooms and a central shower room. These top floor rooms make great bedrooms but would also double as games rooms if required. OUTSIDE To the front is a drive providing parking, which leads to a tandem brick built garage beneath a pitched and tiled roof with roller door, power and light. The rear of the garage has been modified to make an insulated workshop with work tops, numerous power sockets and fluorescent light. The front garden is mainly shingle to the front ideal for pots, and flower planters, side access with gate leading to the rear garden. The property occupies one of the largest plots on the estate and boasts full width terrace leading to the remainder of the garden which is mainly laid to lawn with flower and shrub borders. Further paved area to one side of the property.